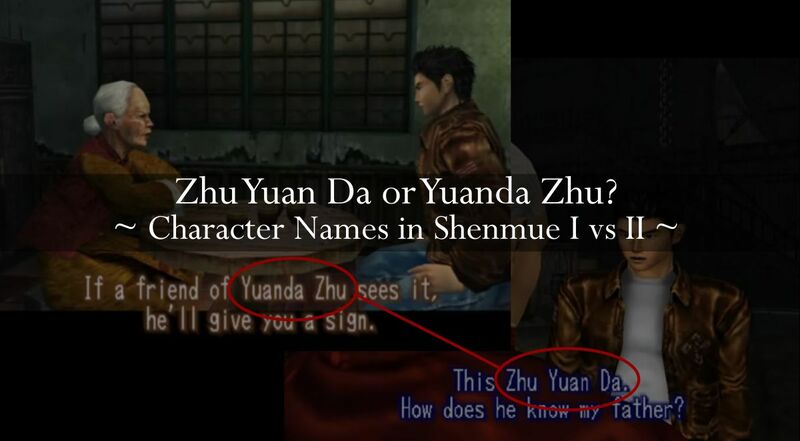 One question that pops up every now and again in Shenmue forums and message boards is about the difference that can be observed in character names between the first and second Shenmue games when playing the English versions. In this post we'll look at some of these examples, and then see how they relate to the order for names used in Japan and China. During Shenmue I, the player is introduced to the names of a number of characters that promise to make an appearance (or reappearance) in future games. 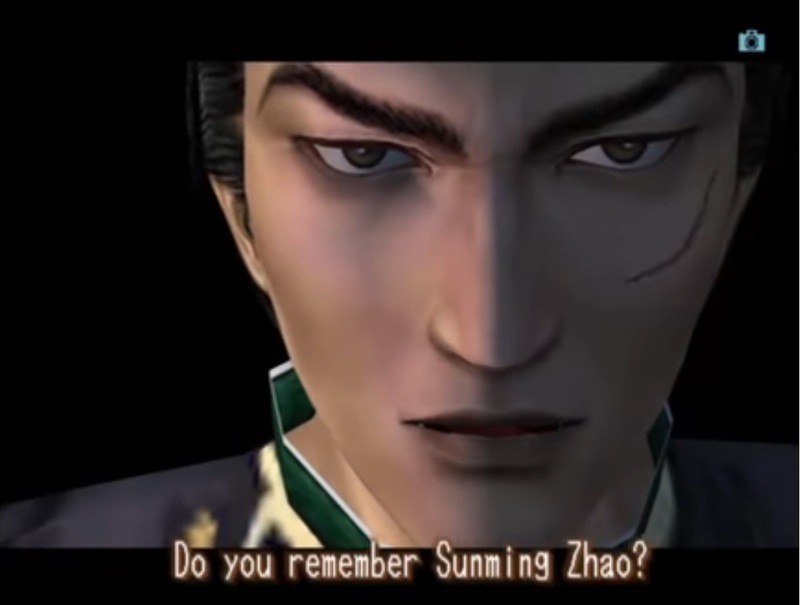 For example, in the opening cutscene of the game, Lan Di menacingly asks Ryo's father if he remembers a man by the name of Zhao Sun Ming. 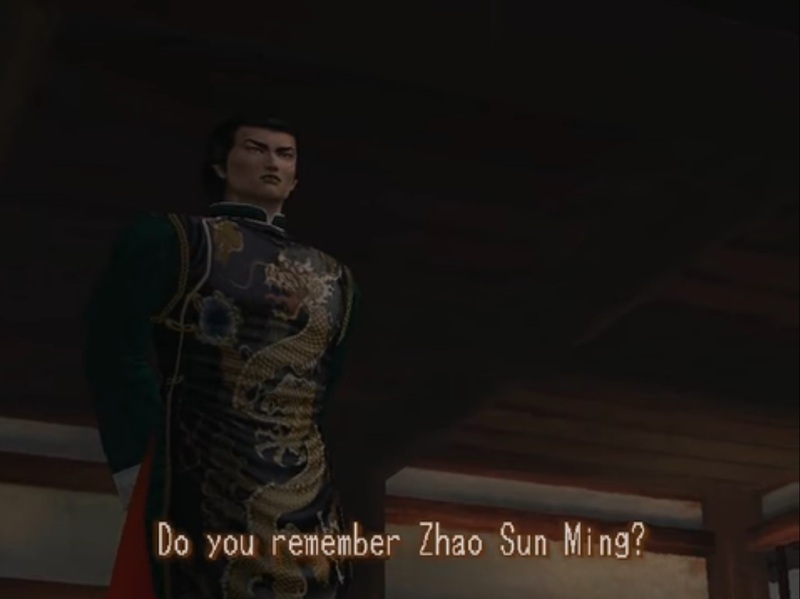 However, it may come as a surprise to the player when they progress to Shenmue II only to discover that, in the recreation of this scene, Lan Di refers to him as Sunming Zhao instead. ...but in a replay of the same scene in Shenmue II, his name is now "Sunming Zhao". Let's consider a couple of other cases. In Shenmue I, Ryo receives a letter from someone whose name that Master Chen calls Zhu Yuan Da, while in Shenmue II, everyone refers to this character as Yuanda Zhu. "Zhu Yuan Da" (Shenmue I ,left) vs "Yuanda Zhu" (Shenmue II, right). Another noticeable case is Master Tao Li Shao, the person whose help Ryo seeks after arriving in Hong Kong. In Shenmue II, the name is rearranged to Lishao Tao. "Tao Li Shao" in Shenmue I (left) transforms into "Lishao Tao" (right) in Shenmue II. So why are there two different ways of referring to the same character, and why the change between games? The answer to the first question lies in the fact that in Asian countries (specifically Japan and China for the purpose of this discussion), the family name comes first. This compares with American and Western countries where the individual's name comes first. So for example, if Yu Suzuki were to introduce himself in Japanese with his full name he would use the order "Suzuki Yu". It can be determined that Shenmue I uses the "surname first-name" Asian ordering of the names, whereas Shenmue II uses the "first-name surname" order. Zhao [surname] + Sun Ming [first name] becomes Sunming Zhao . Zhu [surname] + Yuan Da [first name] becomes Yuanda Zhu. Tao [surname] + Li Shao [first name] becomes Lishao Tao. But what about the case of Lan Di? His name stays the same in both games, as can be seen in the images below. Lan Di: no change in name between Shenmue I (left) and Shenmue II (right). The explanation for this is that "Lan Di" is a kind of nickname or alias, and not his true name (which is Longsun Zhao, as Ryo discovers in the second game). The character for "Lan" means indigo-blue, and "Di" means emperor; so his nickname translates roughly to "Blue Emperor". Since there is no surname involved here, it simply stays the same between games. Another exception is Ryo Hazuki's own name. The order is first name followed by surname in both games. Ryo Hazuki's surname is placed last in both the games (left: Shenmue I, right: Shenmue II). This in fact represents an inconsistency in Shenmue I with its convention for Asian names; here one would have expected "Hazuki Ryo", matching the order of the Chinese names, but this isn't the case. First-name followed by surname is the standard and natural order used for names when speaking in English. I think this was the right decision to make. (And I find that "Yuanda Zhu" rolls off the tongue more easily than "Zhu Yuan Da"). In Japan / Japanese, names that are non-Asian in origin generally keep their "first-name last-name" order. 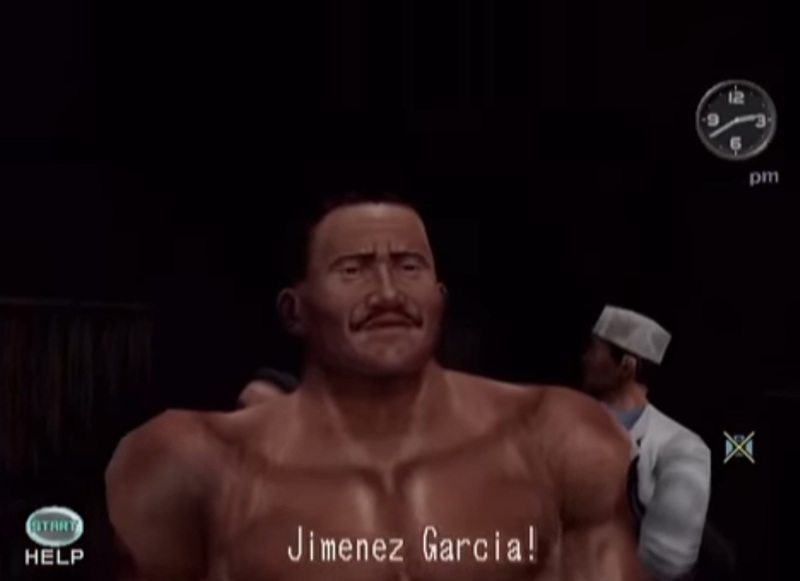 So for example, the names of the overseas wrestlers in Shenmue II keep the same order in English and Japanese. "Jimenez Garcia" is also the order used in Japanese. If you had ever wondered about the naming differences between the first two games, we'd be interested to hear in the comments section below! Thanks to Sappharad at the Shenmue Dojo for suggesting today's topic! I prefer Zhu Yuan Da and Zhao Sun Ming. Maybe just because the voice acting in the first game for those names is pretty iconic in my mind. Yes, with the names being featured in some key scenes in the first game, they leave a strong impression. It took a while for me to get used to the name changes in II. Fascinating read as always. May I asked why the names are more separated in asian-order compared to the English representation? For example, Zhu Yuan Da - the 'Yuan Da' is separated compared to the english-order - 'Yuanda' Zhu. Great question. It turns out that the format "Zhu Yuan Da" is most common when transliterating Chinese names of people from Hong Kong (each part represents the pronunciation of one character in the name, with surname coming first). Interestingly, according to the source below, for writing names of people from mainland China the standard format is 'Zhu Yuanda' - still with the surname coming first. From what i know, Asian names usually puts their family name in front then followed by first name or middle name between family name and first name if they have one. I guess the best answer is reading their name in original letter. Yes, I think the confusion (or choice of how to write it) only creeps in when it comes to deciding how to write it for an English-speaking audience! I'm also in the camp of preferring the Shenmue I surname-first name approach. And as for Ryo being called Ryo Hazuki throughout, that is still consistent if you think that English=Japanese=native language, whereas Chinese=foreign language. So in English we see Ryo's name in a form that is natural to us, but Chinese names are "foreign" to both "us" (American and British) and the original Japanese players. (I was Silas at Shenmue Dojo). Yes, that's another valid way to look at it. I suspect the localization team for Shenmue I and Shenmue II differed and they went with different approaches, resulting in a change between games. W0W!! Blue Dragon - Blue Emperor! This is major, and weird that it hasn't been discussed before! This may tie in the Three Blades and the ancient relevance of both the Hazuki and Zhao families...(old rival clans??). Yes, it's probably something that has become a bit lost or forgotten after all these years. Like you say, Lan Di is also referred to as Souryu (蒼龍 = Blue Dragon) in Japanese, but it's interesting that this is only in Shenmue-related material outside the game and not within the game itself. Yu Suzuki also uses this name when talking about him in interviews, for example. There is an interesting theory about the four Chiyoumen leaders and the colors they are associated with. (This could be a good topic for a future post).